By the 2050s, parts of the Arctic Ocean once covered by sea ice much of the year will see at least 60 days a year of open water, according to a new modeling study led by a University of Colorado Boulder researcher now at APPC. At a time when the scientific consensus on critical issues such as vaccinations and climate change is being called into question, a comprehensive new handbook will examine the current state of the science of science communication. Communication scholar Dietram A. Scheufele from the University of Wisconsin-Madison has joined the Annenberg Public Policy Center as a Visiting Scholar this fall. Seven postdoctoral fellows also have joined APPC, most researching the science of science communication. An article in Science magazine says that new efforts are required to preserve the integrity of science in the face of what appear to be an increasing incidence of irreproducible findings and retractions. Does the public trust science? What are the elements of trust, and how is it built, maintained and lost? Those questions were featured in a National Academy of Sciences workshop at which Annenberg Public Policy director Kathleen Hall Jamieson reflected on trust in science. Speaking at the annual meeting of National Academy of Sciences, NAS President Ralph J. Cicerone cited the work done by a gathering of scientists last winter at the Annenberg Retreat at Sunnylands on science communication issues. Kathleen Hall Jamieson, director of the Annenberg Public Policy Center, will deliver the Henry and Bryna David Lecture at the National Academy of Sciences on April 28. Jamieson will discuss science communication, including examples of outstanding and problematic communication. 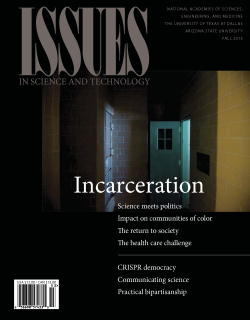 The political spin that so often is attached to discussions surrounding public policy and science is the focus of the March 2015 issue of the ANNALS of the American Academy of Political and Social Science. Politics and science often intermix on matters including climate change, vaccinations, fracking, nuclear power, evolution, genetically modified organisms, and stem cell research, among others.